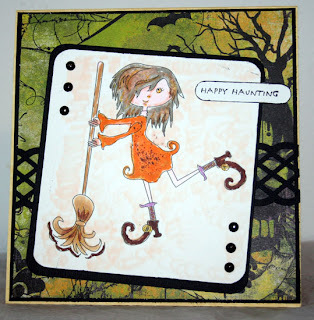 Welcome to Blackleaf's first ever Halloween Blog Hop! You have a chance to win all the images you see on the Design Team blogs. All you have to do is leave a comment at each stop along the way!! If you got here from Shalini's blog , then you are on the right path if not start at the beginning: Blackleaf Designs blog and follow along. I chose to use the Shoes image from the Halloween set, making them almost as large as my card. I then colored them with my trusty Copic markers and added a shipping tag onto which I stamped eek. Aren't they just the sweetest!!! Enjoy and don't forget to leave comments at each stop for your chance to win. The challenge at Sugar Creek Hollow today was to create card using lace. 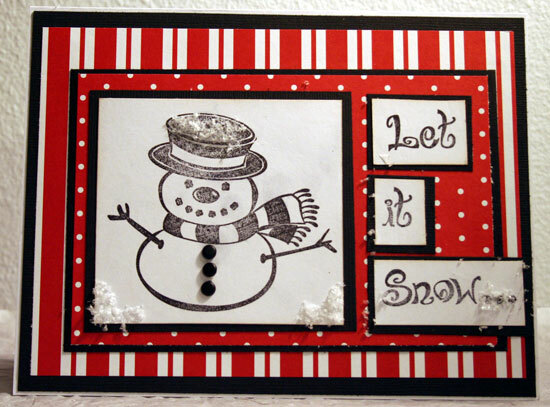 I used 2 Christmas images that I lightly colored, then added some FlowerSoft to simulate snow. 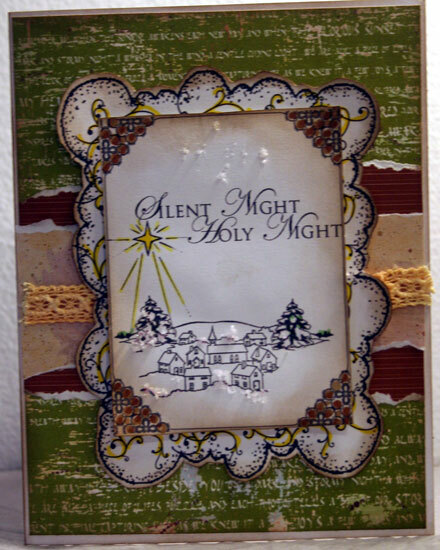 The lace was placed between the 2 images and Glimmer Mist was added for a little shimmer. Start here Tracey's blog and check out all the wonderful creations. 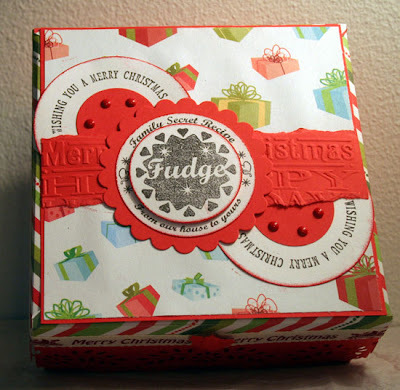 The new challenge at Justrite Stamps is to create a holiday recipe swap. I found this square box which needed some love. I first covered the box with red cardstock. 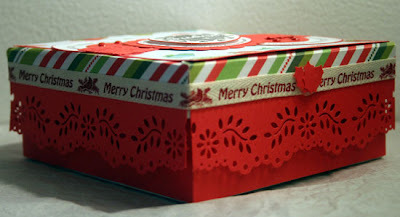 Along the edges of the box top, I used a Martha Stewart punch to create the vine. I used pattern papers on the box top. I stamped the image from the Baking Stamp Ensemble on white cardstock in black, then stamped the sentiment on a seperate piece of white cardstock since I wanted the image to stand out. 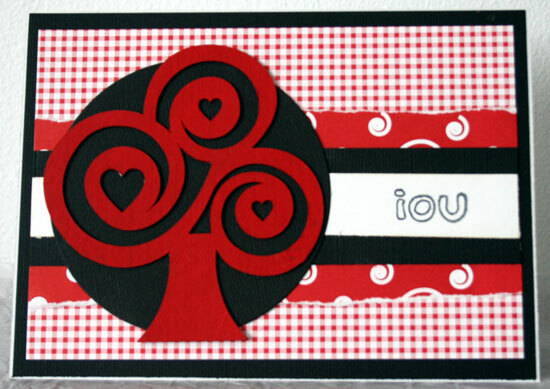 I then cut the scalloped circle in red cardstock and mounted the 3 pieces together. 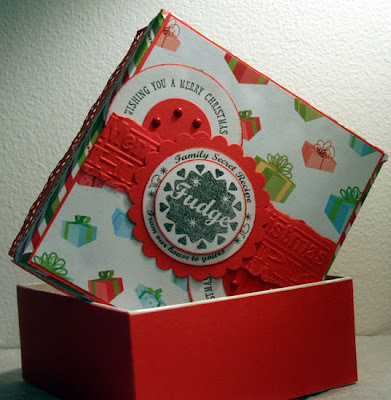 Before adhering the circles, I embossed some red cardstock with a Christmas Cuttlebug embossing folder, adding it across the center of the box. 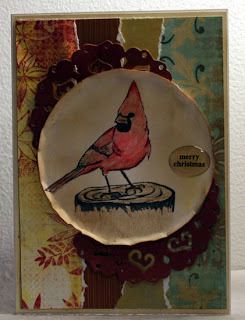 Using Justrite's Demi Phrase stamps , I stamped the half circle, die cut it into a full circle and inked the edges red. I then die cut a smaller circle for the middle, then added this under the embossed cardstock, allowing just the top half circle to show. A few brads finished the look I was seeking. The ribbon around the box gave it a nice finished look. I typed out my recipe, then die cut it using Spellbinders Labels Eight. 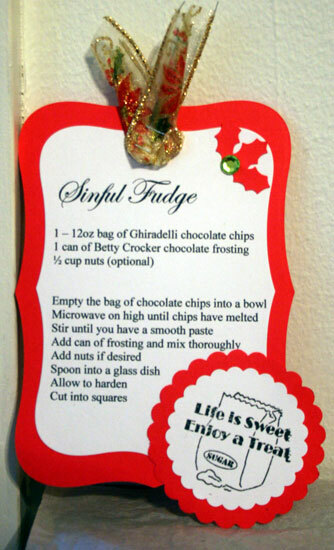 The recipe was then mounted on a corresponding piece of red cardstock. I stamped another image from the Baking Stamp Ensemble and added that to the bottom right corner. A few punched holly leaves and I am done. I'm thinking this will be a great gift for a good friend. It's almost Halloween and I'm sure there are lots of kiddies waiting to go Trick or Treating. 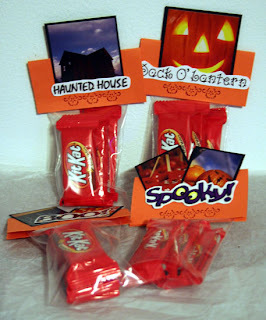 Well, if you love crafting as I do, Halloween can be a lot of fun for making all kinds of wonderful creations. 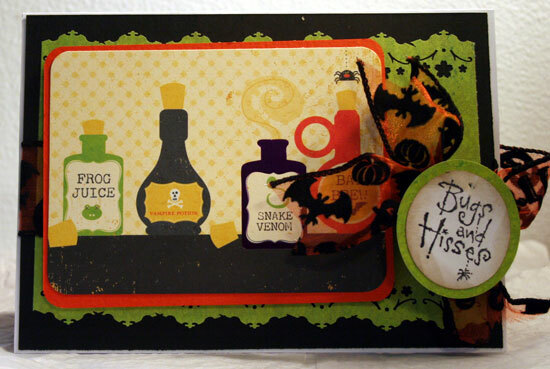 Using stamps from MyStampBOX, and my Cricut, I had a lot of fun creating this Halloween banner!!!!! I used black cardstock for the base, then some DCWV paper on top. To simulate blood, I used the Martha Stewart GOO punch on red cardstock. The letters were cut with my Cricut from silver cardstock and matted with black cardstock. I then die cut some witches, hats and black cat with my Spellbinders dies, tucking them under my letters. 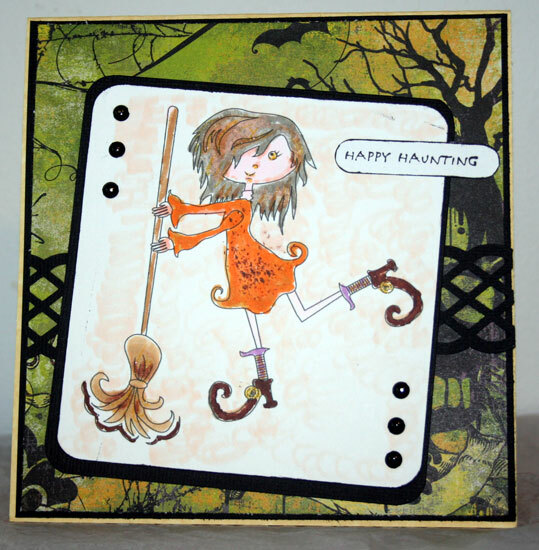 There are 12 stamps in the BOO stamp set, so I stamped a number of images on black cardstock with white ink because I wanted them to stand out. I then punched them out with a circle punch and stapled them along the edge of the banner pieces. I completely forgot to post about MyStampBOX . My cards were posted on the blog last week. That'll teach me for not preposting my projects!!!!!. Any how, MyStampBOX has wonderful stamps and I am truly enjoying working with them. Why not check out the store and see all the fun stamps available. 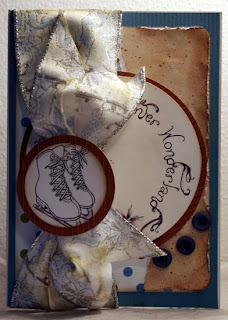 Thanks to everyone who followed along with the first blog hop at Just Imagine Crafts. We had a lot of fun and hope you were inspired by the awesome punches that we showed you. Wonderful treat bags. I would have never thought of putting so much into a treat bag. i think I'm going to steal your idea for Thanksgiving. Love your punch candy. thanks for the chance to win. Congrats Shelley. I'll need your name and address so we can get this punch out to you. Hello all, if you're here for the just Imagine Kreaxion blog hop, you're in the right place! To join the fun simply start at the Just Imagine blog and you're on your way!! 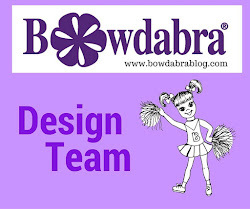 Each design team members will be giving away a different prize on their blog - to be entered into the drawings leave a comment on each blog. There will also be a grand prize too!! You'll be automatically entered into the grand prize drawing by commenting on each blog - and if you "Like" us on Facebook and/or become a follower of the Just Imagine Crafts blog you'll get an extra entry!! Prize winners to be announced on Monday! So far you've probably seen lots of awesome projects from the rest of the team, and you've just hopped over here from Gini ! Please make sure you've left some love on everyone's projects in order to be eligible to win all these amazing prizes! This is my project - Halloweeen is just NOT complete without goodie bags. It's so easy to make bag toppers using any of the Kreaxions punches - just cut a 4" x 4" square; fold it in half and punch along the bottom edge. Decorate the topper as desired. Put some candy in a bag and add the topper. I used Kreaxions border punch #801, but you can easily use any punch in the store to create a unique topper. 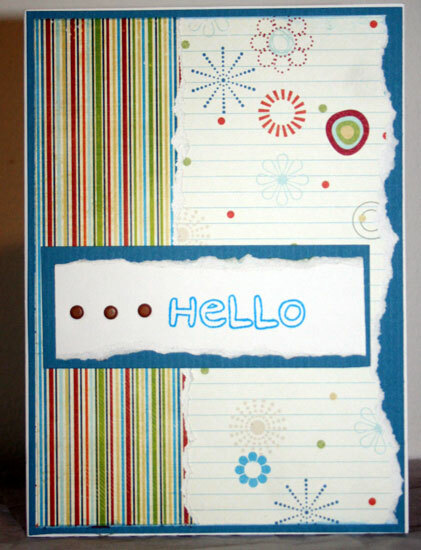 Then I created this card using the circle cutter and punch #921. Just be sure to leave a comment here for your chance to win. So from here, you've almost finished...your next stop is Rebecca's blog . Don't forget to comment along the way...and Happy Halloween! The challenge at Sugar Creek Hollow today was to create card using the Cardinal image. What an awesome image. I chose to color it with Prisma pencils, then added some Ranger Antique Linen around the image before distressing it. 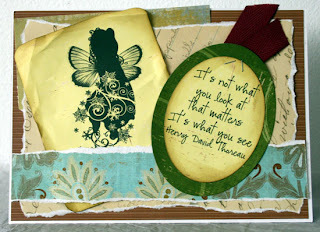 My new DT layout is up on the Scrappin Stuff blog. I am always so impressed with the selection of products I can find in the store. All the supplies used were found in the store . Do you want the easiest and best circle cutter on the market? 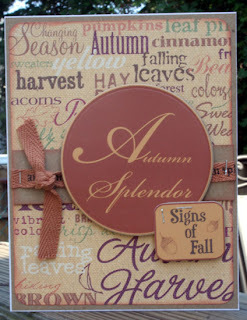 Well, then join our blog hop from Saturday October 23 until 9:00 pm EST Sunday, October 24. 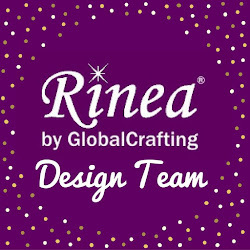 Start at the Just Imagine Crafts blog and check out each designer's blog. The DT have fabulous creations to share with you and each will be giving away a prize. Join us. I had fun working with this wonderful image from Blackleaf Studio , just in time for Halloween. I used Girl from the Trick or Treat set. She is just so sweet - definite a good witch!!!! I colored her with Copic markers and added her to some spooky Basic Grey papers I found. The lattice is an EKSuccess punch. 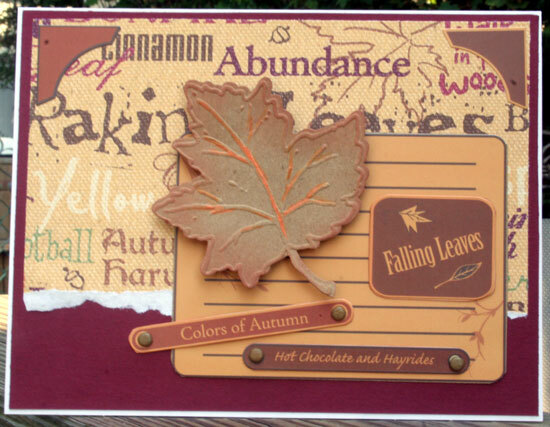 The challenge at Justrite Stamps this week is to create a project with the colors of fall. Well, fall is my favorite time of the year. 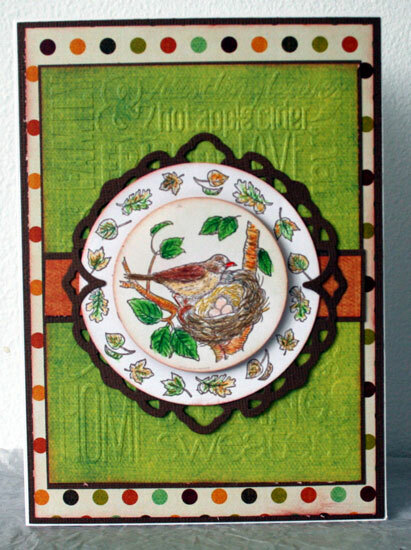 I recently purchased the Backyard Birds and wanted to use one for my card. I colored the image with Prisma colored pencils then went over it with Copic Spica pens for a glossy, shimmery look. I cut the image with my Spellbinders dies and mounted them atop a piece of green paper that I embossed with my Cuttlebug Autumn embossing folder. Early Espress (dark brown), River Rock (sand/tan) and Baja Breeze (bluish-green. I found some papers from Quick Quotes that had these colors. I added another paper atop and distressed it. I then came across some ribbon which I thought would be wonderful to use with images from Winter Wonderland. I distressed the ribbon with Ranger Antique Linen and then hung the skates from the knot. 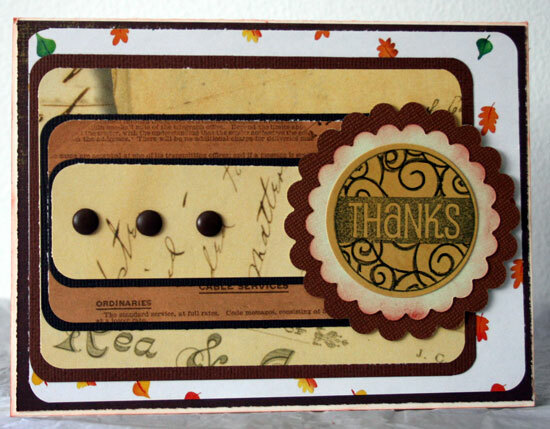 The newest challenge from Justrite Stamps is to create a Thanksgiving or Thank You project. 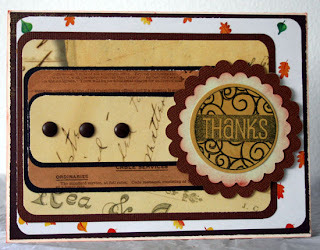 Using Thanks from the Harmony Classic Circle Stamper, I mounted it on some Scalloped die cuts, then created a card with lots of papers from my stash. Well, I am having a lot of fun with my new stamps from MystampBOX . 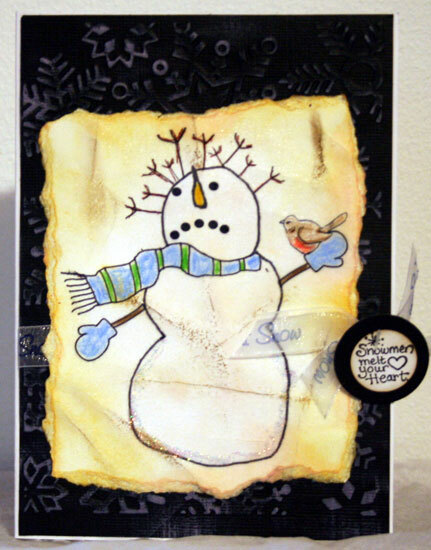 I used Hello from the Color me Sentiments stamp set for this card. Such a pretty set of phrases in this set. I colored my flower with Copic markers and added Crystal Effects for some shimmer and shine. I used my Nestabilities for the die cuts along with Coredinations cardstock and My Minds Eye papers. I've got a set of Autumn Cards up on the Scrappin Sports blog . They have such a wonderful assortment of products for any occasion. It's a new challenge at Justrite Stamps this week is to create a fall 3D project. I wrapped a styrofoam circle with ribbon. 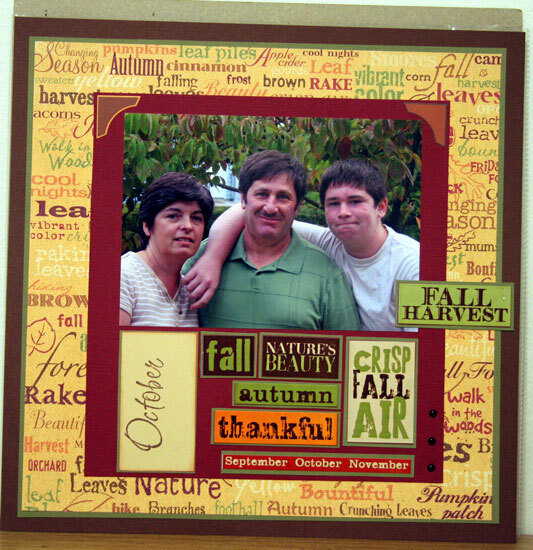 The leaves were cut with my Cuttlebug Leaf die and then embossed. Assorted Tattered Angels Glimmer Mists were sprayed on the leaves, then I used Smooch ink to help the veins stand out. 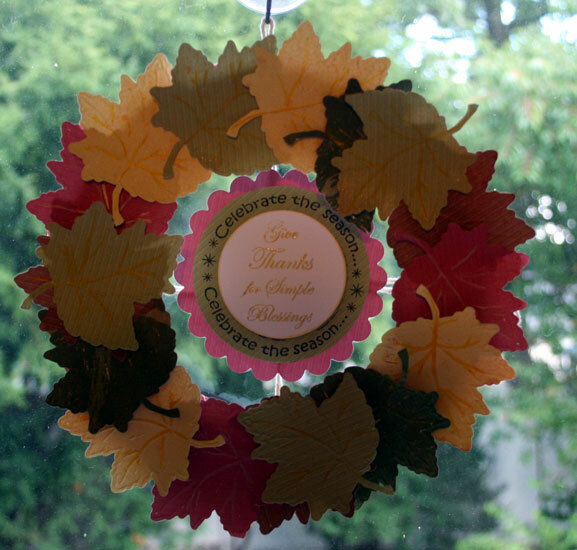 I used the Autumn Blessings stamp set, die cutting it into a circle instead of an oval with Nestabilities. Assorted layers were cut then attached to the back of the wreath with some string. All adhesives are from Glue Dots. I can't wait to get started. Check out the SIWL blog for some amazing products and projects. I've got a couple of cards on the just imagine crafts blog today. I just love these punches and use them as often as I can. 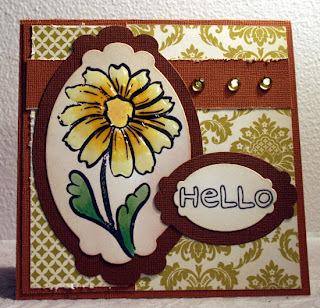 If you pop over to MyStampBOX you can follow along with their blog hop to thank retiring designers and introduce new designers. I am thrilled to have been chosen as a new designer and am showing my first creation with these stamps. I love them. 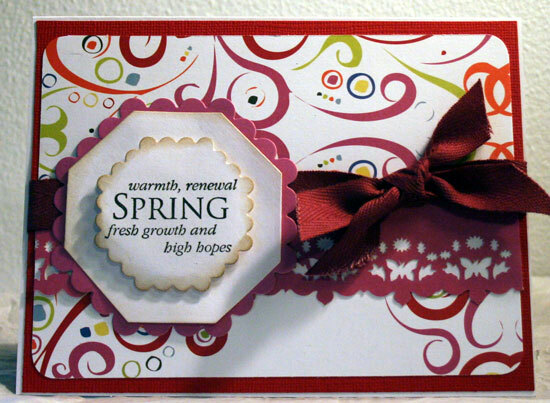 I chose to use Color Me Sentiments for my card. Now hurry over to MyStampBOX and begin your hop. At each stop, please leave a comment and when the blog hop is complete, return to the myStampBOX blog and leave one final comment to have a chance to win a myStampBOX stamp set of your very own! You can participate until Sunday evening. We will publish a winner on this blog next Monday! GOOd mOrning and thank yOu for jOining us fOr the Sugar Creek HOllOw Christmas BlOg HOp. We are gOing tO play the "Secret WOrd" game today. YOu will need to cOllect a letter at each blOg and then pOst your answer at the last stOp. We will be awarding a $25.00 gift certificate tO One lucky winner! Check Out everyOne's wOnderful creatiOns. 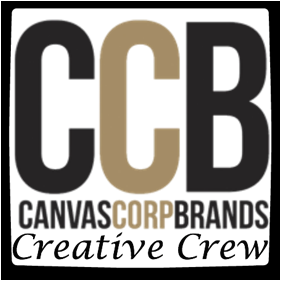 YOur next stOp is the talented Cec . Check Out her gOrgeous creatiOn. 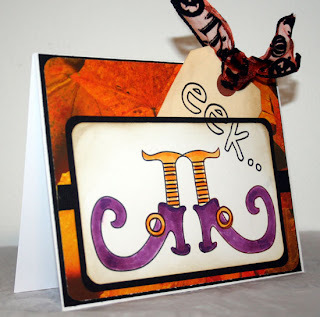 This card is posted on the blog today. I used punch 911 and the Kreaxions Stencil B. I love it. It took me a little while to figure out how to use the Stencil, but boy the possibilities are now endless. I first cut a 5 1/4" square to fit the front of my card. 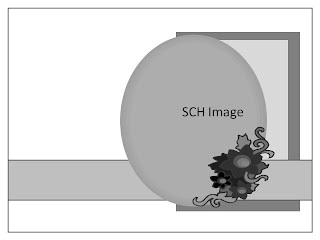 Using Stencil B, I noted my punch lines, then, using punch 911, I punched the interior circle based on the 6.8cm circle (with the small attachment). Following the grid, I was able to line my punch up perfectly. 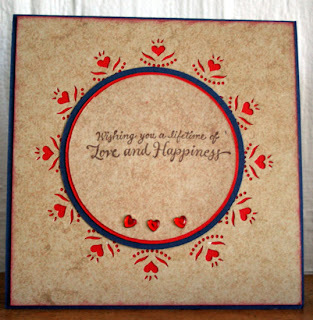 I then cut 3 graduating circles with my circle cutter, stamping my sentiment on the top layer. 3 red heart gems and a little red inking around the edges finished off my card.